A lever is a bar resting on a pivot used to lift a heavy or firmly fixed load with one end when pressure is applied to the other. 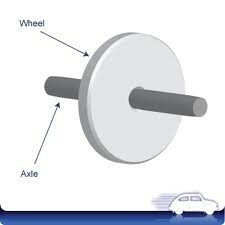 A pulley is a wheel with a rim around it that a cord or rope fits around. You pull the rope to lift heavy objects. A wedge is a triangular shaped tool, a compound and portable inclined plane. It can be used to separate to objects or portions of an object. An inclined plane is a plane surfaced to the horizon. 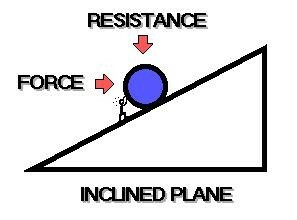 Incline planes are used to increase the distance over which work is done. 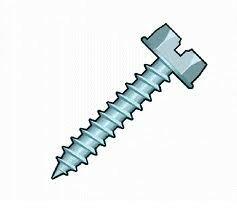 A small and skinny sharp pointed metal pin used to join things together by being rotated so that it pierces the material and is held tightly in place. A wheel and axle is a simple lifting machine consisting of a rope that unwinds from a wheel onto a cylindrical drum or shaft joined to the wheel to provide mechanical advantage.